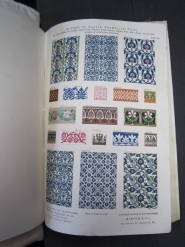 In reviewing the 1867 Paris Exposition, where a large section of display was given to British and French tiles, George Augustus Sala commented on their changing use in the 19th century, from a purely utilitarian fashion to ‘following the example of the Moorish and Turkish interiors … as paneling for walls’.Tile production was a boom industry in the 19th century and a multitude of decorations were applied including Persian styles. These tiles were perfect for use in Oriental-styled smoking rooms which reached the height of popularity during the late 19th century, a place where gentlemen might retreat from female company to a luxurious environment evoking an Eastern harem. Many of these tiles were based on original Islamic decoration but often they were executed with construction, glazes and colors typical of their European manufacture. By this stage these European interpretations were not necessarily considered as inferior to the Islamic originals. To their consumers, European tiles in particular were the result of progress, better technology and a greater knowledge of decorative styles. Minton, Hollins & Co. had a stand at the 1873 Vienna Exhibition where the Bayerisches Nationalmuseum bought a number of tiles from their 1870-71 designed Persian series, regarding these contemporary ceramics worthy of public display. This tile pattern can be found on the walls of the Smoking Room at the Wallace Collection, London. (National Art Library TL.MIN2.3) © V&A Images/Victoria and Albert Museum. Maker: Minton Hollins & Co.
Dust-pressed earthenware, printed in black and hand-painted in various colours with patterns in the Persian style. Impressed mark "MINTON/HOLLINS&CO/PATENT TILE/ WORKS/ STOKE ON TRENT"